As part of its commitment to promote intellectual exchange on South African music, DOMUS has recently hosted two visiting academics at the Department of Music. Marie Jorritsma is a senior lecturer in the Department of Art History, Visual Arts and Musicology at the University of South Africa (Unisa) in Pretoria. She is also the secretary of the South African Society for Research in Music (SASRIM) and the Reviews Editor of the journal Muziki. On 18 September Jorritsma addressed students and staff in the Fismer Hall on the church music of the coloured community of Graaff-Reinet in the Karoo. The paper entitled ‘The hidden histories in the church music of a South African coloured community’, was based on research she conducted for her doctoral dissertation, ‘Sonic Spaces: Inscribing “Coloured” Voices in the Karoo’ (2006), written at the University of Pennsylvania. Also present at the lecture was musician and Solms Delta Museum consultant Alex van Heerden. Together with the two sisters An-Lize en Letitia Davids, Van Heerden gave a live illustration of some koortjies sung in the community of the True Evangelical Church in Atlantis. Jorritsma also referred in her lecture to the koortjies that characterize congregational singing in Graaff-Reinet. Barbara Titus is an Assistant Professor in musicology at the Department of Media and Cultural Studies at Utrecht University. She is also the Managing Editor of the Dutch Journal of Music Theory. In South Africa she has been based as a Research Fellow at the University of Kwazulu-Natal. 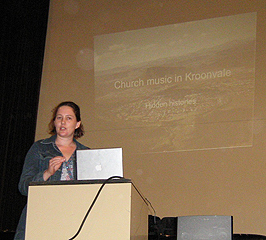 In 2007 she started a project on global representations of South African maskanda music at the Research Institute for History and Culture (OGC), Utrecht University. Her talk on 16 October was entitled ‘Maskanda overseas: Some preliminary enquiries’. She discussed how maskanda has become ‘world music’, and how this transformation affects the musical and intellectual signs and narratives of maskanda.